In a heartbreaking letter to President Pranab Mukherjee, a 42-year-old man in Agra, Mohd Nazir has pleaded for euthanasia or mercy killing for six of his eight children who are suffering from a rare neurological disease. Mohd Nazir said he wanted to end the suffering of his children, aged between 8 and 18 years old, who have all been diagnosed with Canavan disease. The degenerative condition gradually paralyzes the body, leading to seizures as well as vision and hearing loss. 'I am tired of taking care of my children,' he told NDTV. 'I'm a normal sweet shop owner, there's only so much I can do for them. He said that in two to three years, his children will no longer be able to walk but he had no way of financing their treatment. 'They will live out their lives in pain and I don't want this for them,' he said. The couple also have two other children, their eldest son and youngest daughter, who do not have Canavan disease. Mr Nazir's desperate appeal follows the incident of Aruna Shanbaug, who remained in a vegetative state for four decades after a sexual assault and passed away recently after catching pneumonia. The Supreme Court had rejected Aruna Shanbaug’s friend's plea for euthanasia in March 2011 but, in its landmark judgment, allowed passive euthanasia in India. Mr Nazir’s request for mercy killing does not fall under the Supreme Court's guidelines in Aruna Shanbaug’s case for regulated passive euthanasia which allows withdrawal of life-prolonging medical treatment for the terminally ill patients. When such an application is filed the Chief Justice of the High Court should forthwith constitute a Bench of at least two Judges who should decide to grant approval or not. Before doing so the Bench should seek the opinion of a committee of three reputed doctors to be nominated by the Bench after consulting such medical authorities/medical practitioners as it may deem fit. Preferably one of the three doctors should be a neurologist, one should be a psychiatrist, and the third a physician. For this purpose a panel of doctors in every city may be prepared by the High Court in consultation with the State Government/Union Territory and their fees for this purpose may be fixed. The committee of three doctors nominated by the Bench should carefully examine the patient and also consult the record of the patient as well as taking the views of the hospital staff and submit its report to the High Court Bench. Simultaneously with appointing the committee of doctors, the High Court Bench shall also issue notice to the State and close relatives e.g. parents, spouse, brothers/sisters etc. of the patient, and in their absence his/her next friend, and supply a copy of the report of the doctor’s committee to them as soon as it is available. After hearing them, the High Court bench should give its verdict. The above procedure should be followed all over India until Parliament makes legislation on this subject. The High Court should give its decision speedily at the earliest, since delay in the matter may result in causing great mental agony to the relatives and persons close to the patient. The High Court should give its decision assigning specific reasons in accordance with the principle of `best interest of the patient’ laid down by the House of Lords in Airedale’s case .The views of the near relatives and committee of doctors should be given due weight by the High Court before pronouncing a final verdict which shall not be summary in nature. However this tragic story of Mohd Nazir and his children lay bare the reality of a section of our population which may not be in a position to afford adequate health services or take recourse to expensive litigation process. It is understood that the disease is curable; however Mohd Nazir conceded that he could not afford to pay for treatment and insists on euthanising his children. "If not euthanasia, I would request the President to give me financial assistance for the treatment of my children," said the distraught father. After Aruna Shaunbaug, Mohd Nazir’s children have now revived the debate on Euthanasia in India. The debate on Euthanasia is also raging across the world and it has polarized opinions globally. Recently, world renowned physicist Stephen Hawking has added fuel to an already raging fire by saying that he would consider assisted suicide as keeping someone alive against their own wishes is the "ultimate indignity". The United Kingdom has recently floated a landmark Bill that legalises assisted dying in England and Wales — allowing doctors to prescribe a lethal dose of drugs to terminally ill patients. The cause of legalising assisted suicide faced a blow recently when Pope Francis called the right-to-die "a sin against God and creation". The head of the Roman Catholic Church called it a "false sense of compassion". He said "human life is always sacred and always of quality. There is no human life that is more sacred than another — every human life is sacred — just as there is no human life qualitatively more significant than another, only by virtue of resources, rights, great social and economic opportunities". Interestingly, another religious leader — Desmond Tutu — a Nobel peace laureate and archbishop emeritus of Cape Town lent his full-fledged support to Britain's plans of legally allowing assisted death. "We do not agree that the existential formulation of the right to life requires an absolute prohibition on assistance in dying, or that individuals cannot 'waive' their right to life," the court said. 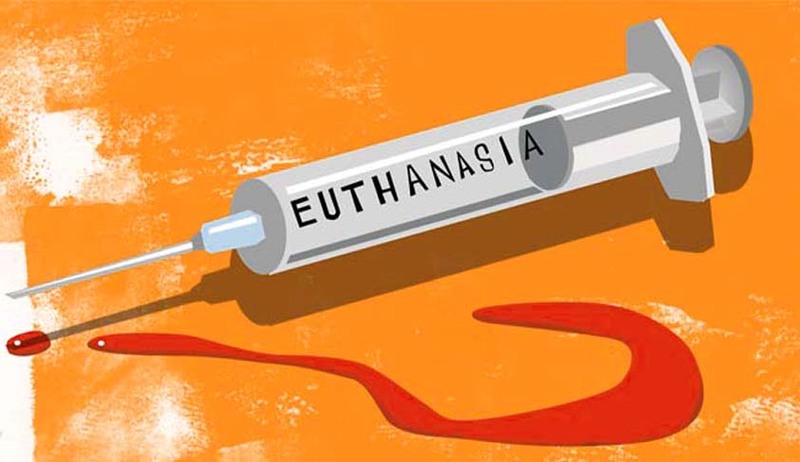 In India, the Supreme Court had in 2014 referred a plea for allowing voluntary passive euthanasia to the constitution bench in the case of a person who is in terminal illness and in medical opinion there is no chance of revival and recovery. The reference came on a plea by an NGO Common Cause which said that a person, who is afflicted with a terminal disease, should be given relief from agony by withdrawing artificial medical support provided to him which is medically referred to as passive euthanasia. A five Judge Bench of Supreme Court in Gian Kaur v. State of Punjab held both euthanasia and assisted suicide not lawful in India and overruled the two Judge Bench decision in P. Rathinam v. Union of India. The Apex Court held that the right to life under Article 21 of the Constitution does not include the right to die. But later in Aruna ramchandra Shanbaug v. Union of India the Supreme Court held that passive euthanasia can be allowed under exceptional circumstances under the strict monitoring of the Court. The difference between ‘active’ and passive’ euthanasia is that in active euthanasia something is done to end the patient’s life while in passive euthanasia, something is not done that would have preserved the patient’s life.. In the last hearing of this case before a Constitutional Bench of the Apex Court headed by the then Chief Justice Lodha, it was observed orally that the issue demands an in depth analysis and whether all States, NGO’s and Humar Right Activists should be allowed to make submissions or not should be decided first. However, post the retirement of Justice Lodha, the issue has remained in limbo.